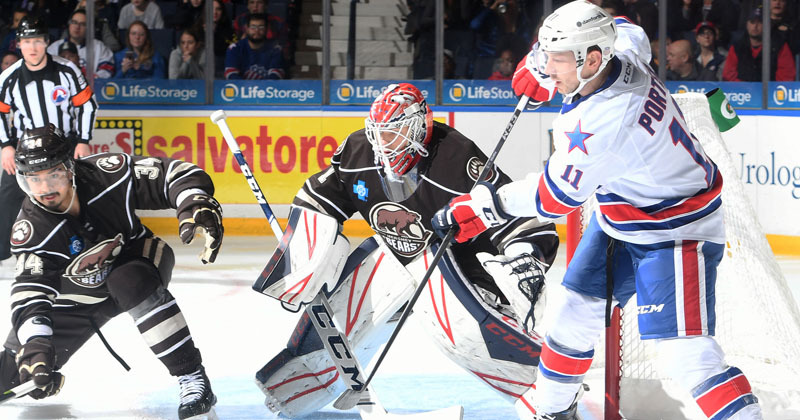 11/02/2018 - The Hershey Bears scored three times in the opening stanza to ride a 4-2 win over the Rochester Americans on Friday night at Blue Cross Arena. Friday's contest marked the 457th all-time regular season meeting between the Bears and the Americans. Similar to the Bears previous game last Sunday, the Chocolate and White grabbed a 1-0 lead from the get-go. Rochester's Zach Redmond was whistled for delay of game after clearing the puck out of play from his defensive zone only five seconds in. On the ensuing power play, Mike Sgarbossa drew first blood from the low-slot. Travis Boyd sent a puck towards the net from the right point, and Sgarbossa successfully redirected the shot past Americans goaltender Scott Wedgewood to make it 1-0 Bears. Later in the period, Riley Barber capitalized on an offensive zone snipe. Immediately following a clean face-off win, Barber blasted a wrist shot to the top corner of the net at 16:44. Hershey's 2-0 lead soon grew to 3-0 after Axel Jonsson-Fjallby capitalized on an odd-man rush. At 18:24, Jonsson-Fjallby put a nifty toe-drag on a defender and released a sneaky shot past Wedgewood to give his club the three goal cushion. The first period field goal marked a new season-high for most goals by the Chocolate and White in a single period. Adam Wilcox replaced Wedgewood in net to begin the second period for the Americans. Following a scoreless middle frame, the Bears continued to possess a 3-0 advantage. Shots after 40 minutes were 18-17 Rochester, and Hershey stood a perfect 5-for-5 on the penalty kill, while 1-for-1 on the man-advantage. Into the third period,the North Division leading Rochester Americans began to push back against Hershey. C.J. Smith broke Bears goaltender Ilya Samsonov's bid for a shutout with a sharp-angle snipe at 5:47. Along the right wing, Smith elevated a perfectly placed shot on the short-side past Samsonov. Later in the period, the Americans pulled Wilcox in favor for the extra attacker and chipped their deficit to 3-2. At 17:18, reigning CCM/AHL Player of the Month, Victor Olofsson scored on the rebound of a Taylor Fedun shot to pull the Americans within one. In the final minute with Wilcox again on the bench, Liam O'Brien flipped the puck into a vacated net to give Hershey a 4-2 victory. Samsonov earned the win in goal after stopping 34 of 36 Rochester shots. Final shot totals were 36-24 Americans. The Bears return to Giant Center tomorrow for the conclusion of a home-and-home stretch against the Rochester Americans. Puck drop is scheduled for 7 p.m. Ticket information is available online at HersheyBears.com.